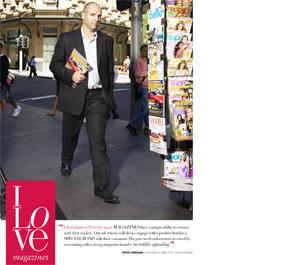 A couple of months ago ACP magazines launched a new campaign with the tagline "I love magazines". Managing directo Phil Scott commented: “We are extremely proud of the creative passion that has gone into this ground-breaking campaign." But a heart in a print ad will not give you love, just as a fancy romantic dinner won´t get you married. Saying "I love you" or even worse "You will love me" is not the way to reach people´s heart, whethere they are dates or customers. True love in both romance and business comes from small gestures, micro signals of love: driving someone to dance class or serving tea in the morning, giving a hug when your partner feels down and going that extra mile - without shouting about it - is love and leads to love. If a brand simply brags about being love, that will not give more love. That will make it look narcissistic. Magazines get love for being a great companion when relaxing, having time off, trying to keep track on trends to be able to fit in... I don´t love them because someone else loves them, especially not the CEO of a media agency who earns his dollars from mags... Do you?